In order to get me super interested in a game, you only have to utter three words – twin stick shooting. When the developer behind the latest twin-sticker has also got previous history for providing one of the most enjoyable Xbox One indie titles to date, then you could probably see and feel my excitement from a mile off. 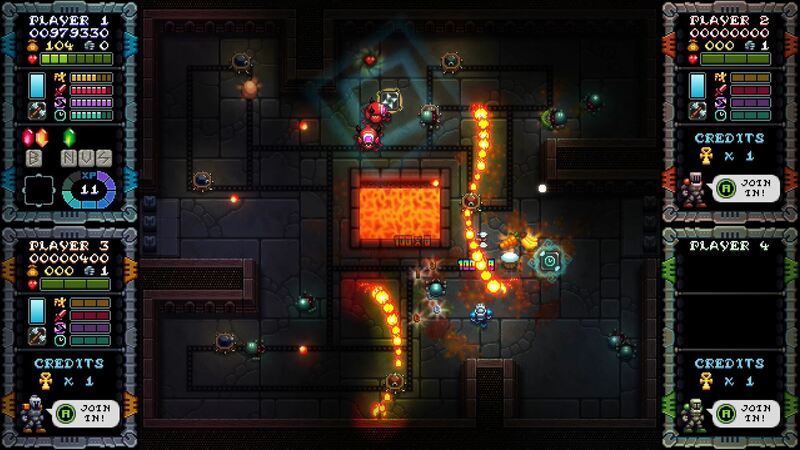 But have TIKIPOD, the devs behind the awesome AQUA KITTY UDX Xbox One Ultra Edition, and now the latest twin-stick shooter to hit the market, Iron Crypticle, kept up their good run of form, or does this dungeon crawling shooter fail to live up to my own personally built hype? Well, if I’m honest, it doesn’t deliver the same marvelous experience that was found when TIKIPOD first arrived on the console scene with AQUA KITTY, but as a decent little fun-bringer, it ain’t bad at all. Iron Crypticle tells a quick and simple story of how an evil force has kidnapped the princess of Cryptonia, along with the King’s riches. It is up to you, as one of the King’s washed-up knights, to head down into the dungeons in order to retrieve both the princess and the treasure. You’ll never be wowed by the tale that Iron Crypticle brings, but then you don’t need a story when the gameplay delivers a decent amount of fun. And that is exactly what happens with this dungeon twin-sticker. 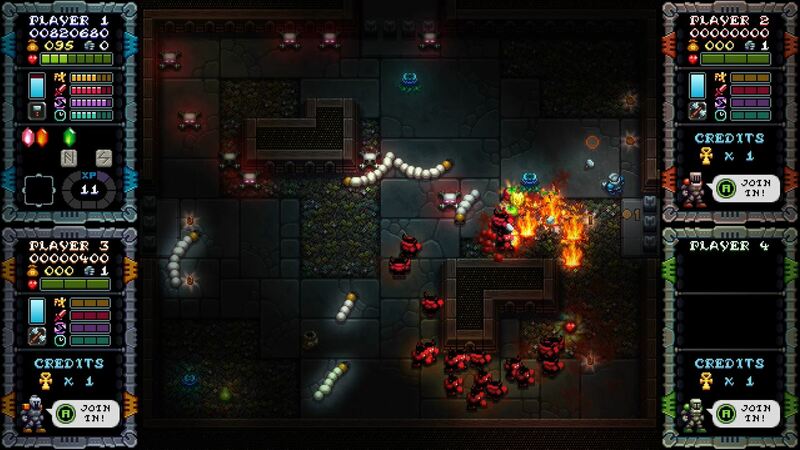 Multiple floors of action hold the shooting mechanics together and it’ll be up to you to make your way through various single screens, each filled with waves of enemies which will need taking out in order to reach the end of floor boss – before ridding the world of him and moving on to the next. You’ll need to be quick in dispatching your foes though as should you stupidly take too long picking out your next target, will quickly find each room filling of indestructible super villains. The visuals do the job intended of them and even though the pixelated retro style is fine, there are occasionally times when you’ll get confused between what is a shiny treasure filled pickup and what is a big bad enemy. The shooting works well too and even though your character is limited to just eight degrees of shooting angles, the fast paced nature of the game means that is never really too much of an issue. You are also equipped with a dash (which you’ll need to use more than you ever thought), and a super powerful magical Atomic Fist which destroys everything within a certain radius. With various weapon types all unlockable the more you play the game – and then appearing in all future playthroughs – and a whole host of food themed treasure pieces dropped by the vast majority of enemies, it’ll be up to you to consider the benefits of standing back and taking the ghastly opponents out from a distance, or getting up close and personal in order to nab as much treasure, super powerful magic scrolls, coins and new weapons as you can. With XP increases dependant on your killing sprees, and the opportunity to level up a few significant abilities should you manage to chain together big combos, you’ll need to be quick and precise in your actions too. The extra weapons themselves are timed affairs with a limited lifespan, but thankfully you’ll never be left without, as even the bog standard pain giver that your knight is initially equipped with is more than enough to kill off the mindlessly wandering zombies, fast flying dungeon bats and all manner of other enemy types. These fiends attack in multiple ways too – some will just walk away in a daze, just getting in your way as much as possible, whilst others will sit in one place firing projectiles your way. More still will arrive to deal as much damage as they can to your character, especially as you find your route taking you to deeper floors and tougher waves, with a bit of a bulletstorm taking hold should you manage to survive for long enough. Unfortunately, when you do die, you’ll be left to start right back at the beginning again, with only your unlockable treasures and weapons appearing in the ledger. It would be nice to be able to find the option to skip Floor 1 once completed, as it’s a bit of a pain having to run through its ease, time and time again just to come a cropper on a future floor. With it taking roughly ten minutes or so for you to complete a floor, once you’ve done it once, you’ll most definitely get frustrated at the lack of difficulty found in the earlier stages – even if each stage does get a bit of a mix up on every playthrough. The stages themselves are well created and even though many are very dark – as you would expect to find within a dungeon – all are slightly different and will require a variation of tactics should you wish to complete them. 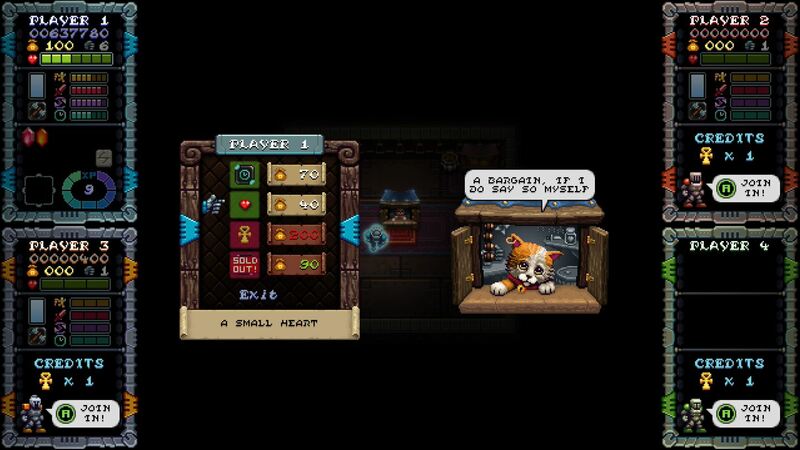 You will also find certain levels bereft of enemies and instead taking you to a shop – with a gorgeous kitty merchant ready to do business – in order to purchase extra health, faster feet or more powerful weapons. All of these will be needed before you attempt to fight off the end of floor bosses. 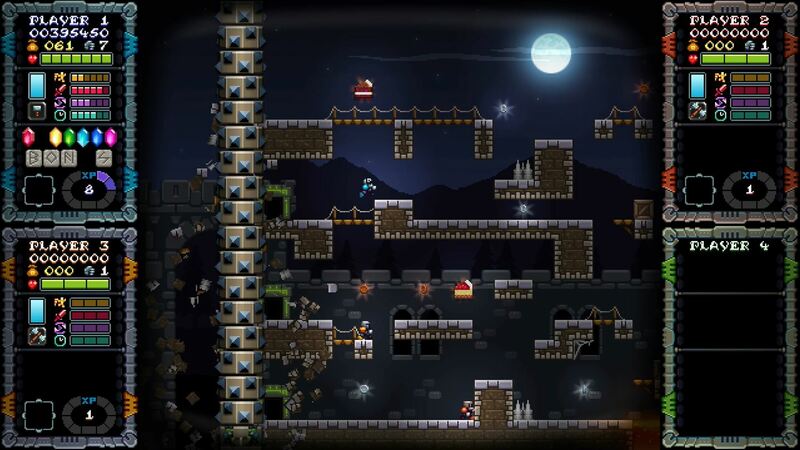 There are also some lovely coin collecting bonus arcade ‘Castle Crushers’ stages in which you get to jump and platform your way across side scrolling stages, collecting cake and money as you do so. You’ll need to be super quick on these though, as a constantly spinning spike rotator follows you to ensure that you’ll need to pick the best path possible. These stages are a lovely addition to the standard single screen, twin stick, enemy destroying madness, but it would have been nice to have had the opportunity to partake in them a little more. Aside from the standard campaign mode, an Endless option is in place and this does exactly as you would expect – dropping you into the action and requesting you to fight off as many waves of dungeon ghouls as is possible. It’s great for a quick hit of action – especially if you’re trying to mop up some achievements – or when you really don’t feel like battling the forces of the standard campaign anymore. With easy, normal, and hard difficulty levels in place for both the campaign and the endless mode, and online leaderboards to suit each, the draw of trying to beat your mate’s score is a big one. So, Iron Crypticle is a decent game that is well worth a shot, especially when you take into account the price asked of it, and the amount of replayability that is included. 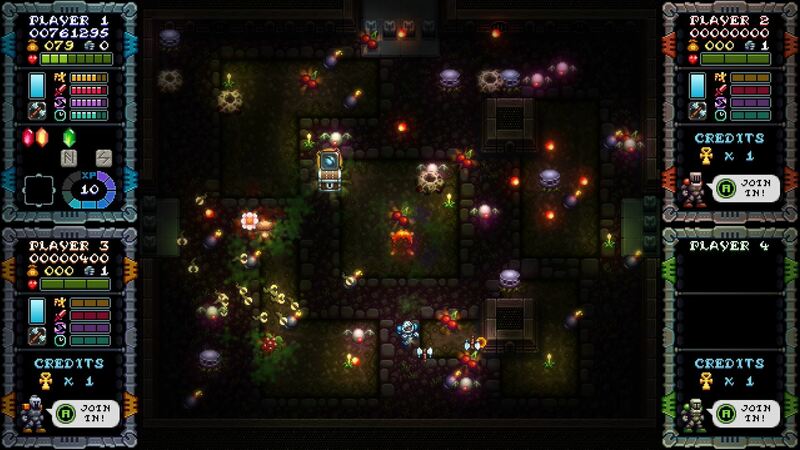 Yes, you’re not going to be stunned by anything it brings, but as an indie package, you could do worse than head off into the dungeons to retrieve some lost treasure… especially if you can drag some mates along for the ride. Next articleTrunks to join the Dragon Ball Fighterz action as closed beta is announced!